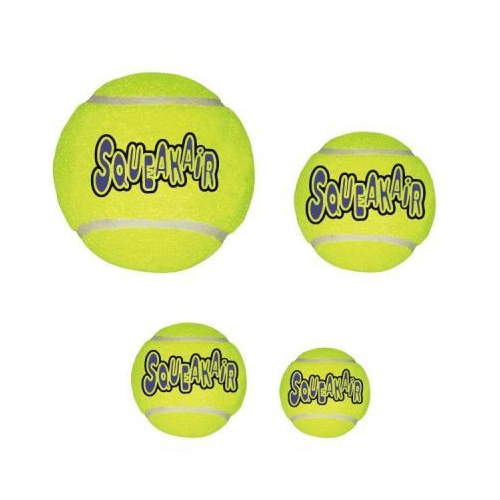 The KONG AirDog Squeakair Ball is designed to be a combination of two toys: the tennis ball and the squeaker toy. This ball is perfect for fetching games. The KONG AirDog Squeakair Balll is designed to be a combination of two toys: the tennis ball and the squeaker toy. This ball is perfect for fetching games. The ball is made of non-abrasive felt material and doesn't cause any damage to your dog's teeth, in contrast to the abrasive material of regular tennis balls. Not only does the ball float on water, but the squeak is also very stimulating during play. Take a look at the other toys in the KONG AirDog range. Have you used KONG AirDog Squeakair Ball before? Let us know what you think about this product. My GSD isn't really a ball pooch, but he absolutely loves these squeaky tennis balls!!! Provides Hours of entertainment...on his own as well as in the park.